It was another tough weekend here in this paradise known as the Adirondacks of upstate New York. The sun cooperated and we were treated to beautiful corn snow and incredible Spring skiing. This past weekend was another good example of why I choose to live here. I was able to work a fair amount, visit, party, entertain guests, ski, ski, ski, and attend the required meeting of the Wilmington office of the Prudential Terry Horrocks Real Estate Agency, as evidenced in today's featured photo. 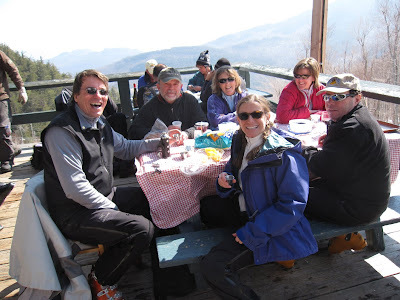 Sunday at Whiteface was indeed one for the record books as the slide show will attest. Skiing was so good we couldn't bear to stop until we had no choice when our legs gave out. The vital importance of the food and rest aspect of a day at the mountain should not be underestimated! If you think you might be able to get used to this sort of Adirondack lifestyle, let me know. I am a real estate agent and business broker and would be happy to find you a place to live, a vacation and investment property, or a business to buy. Or all three! I can guarantee you'll find all the elements of a wonderful and healthy lifestyle. All you have to do is make the decision.